I am not overly found of time travel books. I think they tend to get too involved with paradoxes and such and forget good story-telling and writing techniques. Pages and pages of philosophy on killing your own grandfather when he was a boy just doesn’t cut it for me. 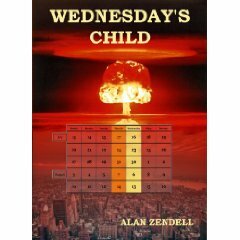 However, I was given Wednesday’s Child, by Alan Zendell, and I was quite engrossed with it, reading it quite quickly. While paradox did rear its ugly head, the book examined time travel in a unique and entertaining way. Two main themes put Wednesday’s Child in a different playing field. The first is the question of how to determine what actions need to be taken to avert a catastrophe when given only small windows of time, and the second is how would time travel be affected if it was being coordinated by a higher being? Basically, the premise of the story is simple. The protagonist, Dylan Brice, goes to sleep on Tuesday night, but wakes up on Thursday morning with no recollection on what happened on Wednesday. When he goes to sleep on Thursday night, he wakes up on Wednesday morning with a full recollection of what he learned on Thursday and with a will to avert certain things happening. And while he has a regular job, he also is a resident geek for the “Agency,” which I assume is the CIA. He is on a team which is tasked with fighting terrorism. Because of this, he is positioned to actually do something about a group of terrorists who have brought in radioactive materials to make dirty bombs to use against the US. With a bombastic president in office, this could lead to world war. First, Dylan has to figure out just what is happening to him. Of course being crazy was a consideration, but as he gets a feel for the “rules,” he thinks that he may have been placed in this situation by a higher power, perhaps one anxious to avert world destruction, but limited in what direct action he/she can take. This higher power can shift things a bit, but must use a person to do the actual work. Each week, Dylan is able to do a little more in fighting the threat. But in order to do so, he needs to bring in others, such as his wife, an FBI agent, and an agent for the Mossad. Surprisingly, they seem to accept his strange ability. Normally, this would be strange, but what if the higher power was steering people to him who would be more conducive to believing him? Overall, this is a taught novel, full of action, but logical in how things progress. I didn’t know what to expect, but I got a very, very enjoyable read, thought-provoking and fun.